How Was Jesus Involved in His Own Resurrection? Did the Holy Spirit raise Jesus from the dead? Q. Paul writes in Romans, “If the Spirit of him who raised Jesus from the dead is living in you, he who raised Christ from the dead will also give life to your mortal bodies.” Can this statement be used in support the idea that the Holy Spirit raised Jesus from the dead? For this particular statement to be used that way, it would have to refer to “the Spirit who raised Jesus from the dead” rather than “the Spirit of him who raised Jesus from the dead.” However, there’s another interesting statement in Romans that suggests that the Holy Spirit might indeed have had a role in raising Jesus from the dead. Paul says something a little earlier in the letter that’s parallel to this later statement: “Just as Christ was raised from the dead through the glory of the Father, we too may live a new life.” Here Jesus’ resurrection is not attributed directly to the Father, but to something (or someone?) associated with the Father. This raises another very interesting question: If all three persons of the Trinity work together in every one of their activities, was Jesus involved in his own resurrection? The book of Hebrews makes this interesting statement: “During the days of Jesus’ life on earth, he offered up prayers and petitions with fervent cries and tears to the one who could save him from death, and he was heard because of his reverent submission.” Jesus actually did die an earthly death, on the cross, and so this statement that his prayers to be saved from death were heard seems to be describing his resurrection. In that case, Jesus was involved in his own resurrection through his prayers and submission, that is, his trust in God. Hebrews goes on to say, “Although he was the Son, he learned obedience from what he suffered. After he was perfected, he became the source of eternal salvation for all who obey him.” This, too, would suggest that the Second Person of the Trinity was involved in his own resurrection through his trusting obedience, and in that way he contributed to the achievement of salvation for humanity that the whole Trinity was working for together. Trinitarian theology, when conducted rightly, deploys a venerable and copious set of conceptual tools for precisely that task of mind-turning (μετάνοια), because, having heard the word of the one who said “and now, Father, glorify me in your own presence with the glory that I had with you before the world existed” ( John 17:5), it breaks forth in praise that has the character of verbal-conceptual profusion. It names him as only-begotten and the filially proceeding and declares that his prevenient glory is shared with the Father and the Holy Spirit undividedly, consubstantially, and perichoretically, as three persons subsisting in relation. These are just the most historically prominent of the concepts crafted to assist the mind in turning to the glory of the Trinity. Each of them, and the entire corpus of them, directs us to the scriptural witness as the triune God’s self-testimony. With the confession that the Son and the Holy Spirit are from the Father and that “it must have been always so,” the doctrine of the Trinity arises like praise from the horizon of salvation history. This insight that the Son and the Holy Spirit are not mere surface phenomena of God’s ways with the world is the insight that must be articulated in order to set the history of salvation in the right context. “The economy of grace in all of its dynamism drives one to say something about its source, its very condition of possibility,” writes Christopher R. J. Holmes. The Son and the Holy Spirit are sent by the Father because they are, together and in person, the source of salvation, and the divine condition of its possibility. Trinitarian praise points back to that triune source. This is the matrix of Trinitarian theology: wonder, love, and praise that God has done for us and our salvation something that manifests and enacts what he is in himself. perichoresis = a Greek term used to describe the triune relationship between each person of the Godhead. It can be defined as co-indwelling, co-inhering, and mutual interpenetration. Did God Need Our Love, or Have Extra Love to Spend? Today’s devotional is going to be uncharacteristically short, but I hope the question it poses will stay with you. In some ways it continues where we left off yesterday. In other words, you could ask if God’s creation of mankind came out of a need or out of an overflow; because of a dirth or because of a glut. I believe that for Hughes, this isn’t a conclusion drawn from a single verse or proof text, but through a lifetime of study out of which has emerged an understanding of the character and ways of God. I also believe that a fuller understanding of what we call the Godhead, a more overt way of expressing the idea of God as a self-contained community of Creator, Word, Spirit (or Father, Son, Spirit) reveals to us that there is already love of the Father for the Son and the Spirit, and the Son for the Father and Spirit; the Spirit’s work being pleasing to both Father and Son. In other words, God’s creation of us reflects a surplus of love, not a shortage. All other implications of God’s love for us stem from such an understanding. Rather than starting a list here, let me leave it open: What areas of the Christian life are affected by knowing this principle? Wait a Minute! What Did Jesus Just Say? This verse is often used as a rallying cry for Christian unity and promotes the ideal that there would be no division in the capital ‘C’ Church. But Jesus isn’t just saying that, he’s saying that we would be one just as the Father (to whom he is praying) and himself are one. What does that mean? We’ve used this diagram before here to promote the idea that each part of what we call the Godhead maintains complete unity with the other but is also distinct. The Father is God. The Son is God. The Spirit is God. But the Father is not the Son or the Spirit; The Son is not the Father or the Spirit; The Spirit is not the Son or the Father. This is summed up in The Athanasian Creed. When you click through, you see something much longer than the Apostles Creed and the Nicene Creed. Part of the length is this qualification that each holds distinction but is part of the unified whole. (I once suggested it was written by lawyer!) The purpose is to spell out the complexity of what we call Trinity in unmistakable terms. So…back to John 17:21. Is Jesus suggesting that in becoming one with the Father just as he and the Father are one, we need to re-draw the diagram? Does that make us part of the Godhead, too? (Father, Son, Spirit, Church?) Some tools at BibleGateway.com are useful here. So first of all with respect to the idea that Jesus would incorporate the Body into the triune relationship, this is not intended. Jesus is not suggesting that. The request is not literal, nor is it hyperbole, but it is a simile. Rather, Jesus is praying that we would have the same type of unity, the same type of intimacy enjoyed by the Father, Son and Spirit. What would it look like to see that happening in The Church today? Is There a Hierarchy within The Trinity? As much I’d love to engage comments on this one, I find this topic often attracts people who want to debate Trinitarian doctrine itself from one particular viewpoint. Therefore, I suggest that today comments be referred to the source blog of the article. This appeared at a blog I highly regard and respect, Parchment and Pen. Author C. Michael Patton originally posted this under the title Why Jesus is Greater than the Holy Spirit. Since there is only one God, one member of the Trinity, in his essence, cannot have more power, authority, or dignity than another. They all share in the exact same nature (ousia, ontos, “stuff”). I did not understand this until later in my Christian life. For many years I existed as a functional polytheist (a tritheist, to be technically precise). I believed the three members of the Trinity shared in a similar nature, not the exact same nature. In other words, just like you and I share in the nature of being homo sapiens, so the members of the Trinity are all from the “God species” . . . or something like that. But this is a bad analogy since, though you and I may be the same species, we are different in essence. You are you and I am me. I have my body and you have yours. But in the Trinity, all three persons share in the exact same essence. One in nature; three in person. One what; three whos. Confused? Good. Anytime you have an “aha!” moment with regard to the Trinity, it is a good sign you have just entered into the world of heresy. While I don’t believe there is an ontological hierarchy (gradation of essence, or all that stuff I said above), I do believe there can be a hierarchy in person. In other words, one member of the Trinity can take on a different rank than another. I think we can all agree that at the incarnation, this hierarchy presented itself as Father, then Son, then Spirit. After all, even Christ said that the Father was greater than he was (John 14:28). This is sometimes called a “functional hierarchy.” This should not be too difficult to process, as we can see many analogies to this in our own world. For example, President Obama is greater than I am in one respect. He is the President of the United States. Therefore, his position and authority are greater than mine. But he is not greater in essence. Similarly, parents are greater than children in rank. But they are not greater in their being. And (cover your eyes, egalitarians) I believe the Bible presents the husband as having greater authority than his wife. However, he is not greater in his ontos or humanity. When it comes to the Holy Spirit, I believe the Holy Spirit is last on the divine authority totem pole. The Father sends the Son, the Son sends the Holy Spirit, and the Father is sent by none. 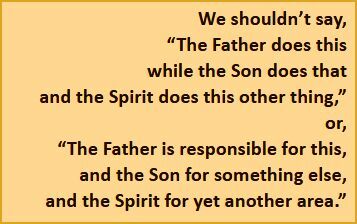 There is much less said about the Holy Spirit in the New Testament than either the Father or the Son. But as far as honor and dignity, it would seem that Jesus Christ tops them all. When I read the Bible, I am struck by how much Christ is the center of all things. He is the image of God which is seen, the one who becomes incarnate and relates to humanity more than any other, he is the one who calls us friend, he is our intercessor, and he is the one in whom we are to believe for eternal life. In fact, the very name of our faith finds its basis in his name. It is not called Holy Spiritanity or Fatheranity. It is not even called Yahwehanity. It is called Christ-ianity. Another way to think about it can be illustrated as follows: The first two members of the Trinity have very relational names. We find it easy to relate to the title “Father,” since most of us have an example (though not perfect) through our earthly fathers. So “Father” is endearing. And “Jesus” is a personal name. I figure that he will always go by that handle. And the father may always go by “Father.” But what about the Holy Spirit? “Holy Spirit” is such a distant and (forgive me) cold name. Is that really his name? First name “Holy” last name “Spirit”? Do those who are close to him just call him “Holy,” while everyone calls him “Mr. Spirit”? Maybe in heaven we can get the insider scoop on what his real name is (not Yahweh…that is a Trinitarian name, as they are all Yahweh). Maybe Bob, John, Nate, or Michael. Just something more personal, as I envision having a very distinct relationship with him in the new earth. My point is this: the Holy Spirit, while having equal power, authority, and diginity as the Father and the Son, and having the same nature as Jesus and the Father, is the least spoken about and recognized of all three members of the Trinity. By the way, before you begin to feel sorry for him, realize this: this is intentional. The Holy Spirit does not seek air time. We often talk about Christ’s humility (and rightly so), but we rarely recognize the Holy Spirit’s humility. His primary purpose is not to get you to recognize him (as deserving as he is), but to recognize Christ. Did you get that? The all-powerful, omniscient, everlasting creator of all things — the Holy Spirit — will not testify about himself, his glory, and his person, but about Christ, whom the Holy Spirit loves with a greater love than we ccould ever imagine. Why doesn’t the Holy Spirit testify about himself? After all, he has every reason to pat himself on the back and toot his own horn, yet all he wants to talk about is Jesus. Why? I can’t tell you how the role distinctions were chosen for redemption. It is possible that the Holy Spirit could have been the one who became incarnate and died on the cross. It could have been the Holy Spirit to whom all attention was given. Yet this is not the case. He elected to humble himself to the point of almost non-recognition. I believe the Holy Spirit is just as much God as the Father and the Son. I believe the Holy Spirit deserves as much honor as the other members of the Trinity. Yet the greatest way for you to honor the Holy Spirit and evidence his work in you is to glorify Christ. What an example He is. Why is Jesus greater in function than the Holy Spirit? Because that is the way he wants it. Amazing! Comments Off on Is There a Hierarchy within The Trinity? Spoiler alert: This is from the final pages of Eugene Peterson’s The Jesus Way. …Psalm 2… is a favorite psalm of new Testament writers. It is quoted or alluded to nine times… It shares honors with Psalm 110 as the most quoted psalm in the new Testament. The contrast with our times is significant. What are our favorite psalms? What psalms have we memorized? Psalm 23 tops the chart. Psalms 1 and 100 and 121 are runners-up. But Psalm 2? The first generation of Christians took Jesus at his word when he announced that his kingdom was at hand – a real (not ideal) kingdom with a real king, King Jesus. The words and sentences of Psalm 2 dismissed the pretensions of all these other ways and let Christ the King permeate their preaching and prayers and following. They followed the resurrected Jesus with an air of triumph and praise. The gospel was not something private that they cultivated in the cozy security of their homes and hearts; it was public, the most powerful force in human history, shaping the destiny of nations as well as the souls of men and women. And there is this: the prayer is Trinitarian. It is addressed to God the Creator: “Strong God, you made heaven and earth and sea and everything in them” (Acts 4:24). It uses as its text the inspired words of David that God spoke “by the Holy Spirit” (v. 25); and all the action is entered in “your holy Son, Jesus… messiah”(v. 27). By insisting that God is three-personed — Father, Son, and Holy Spirit; God-in-community — we are given an understanding of God that is emphatically personal. The only way he reveals himself or works among us is personally. God is personal under the personal designations of Father, Son and Holy Spirit, and never in any other way. Never impersonally as Force or Influence. Never impersonally as Idea or Cause. It is the easiest thing in the world for us to use words as a kind of abstract truth or principle, to distribute the good news in tabloids of information. Trinity prevents us from doing this. We can never get away with depersonalizing either the gospel or God to make things easier, simpler, or more convenient. And Trinity is a perpetual reminder that the only way we can follow in the way of Jesus is by being personal participants — not just by thinking right thoughts or carrying out assigned tasks, but prayerfully and believingly involved in the very lives with whom, name by name, face by face, God is involved. For those of you who enjoy Peterson’s writings, a new book, Practice Resurrection, is now available in paperback from Eerdmans. To read another excerpt from The Jesus Way, click here. MSG Col 2: 9-10 … Everything of God gets expressed in him, so you can see and hear him clearly. You don’t need a telescope, a microscope, or a horoscope to realize the fullness of Christ, and the emptiness of the universe without him. When you come to him, that fullness comes together for you, too. His power extends over everything. This term is used only here in the Bible, although Paul and other writers use similar phrases and ideas elsewhere (John 1:16; Colossians 1:19). When Paul wrote to the Colossians, part of his purpose was to refute a teaching called Gnosticism that was influencing some of the Christians at Colossae. According to this pagan belief, all matter was inherently evil, and only the soul and the mind were good. This logically led to a denial of God’s creation of the world as well as a denial of Jesus’ incarnation or humanity. Gnostics denied that Jesus was ever human and that Jesus died physically or was literally resurrected from the grave. In this letter, Paul attacks these teachings and argues that Jesus, as God, created the universe (1:16), died on the cross (1:20), and had a human body (2:9). But he adds more, declaring that during His time of humanity, Jesus also retained all the attributes and characteristics of God (see also Philippians 2:5-8). All the powers and attributes that Jesus possessed in His deity were also present in his humanity. All that God is in His divine essence is present also in Jesus Christ. No inferiority or subordination exists within the Trinity or between God the Father and God the Son. God’s loving, merciful and forgiving nature was manifested and demonstrated by the life and death of Jesus Christ. He was God incarnate, and that is why He said, “He who has seen Me has seen the Father” (John 14:9). In Colossians 2:9, Paul is doing more than simply teaching a technical or abstract point of theology. He is reminding the Colossian Christians and all who would hear this letter that because Jesus is God and Christians have a unique relationship to Him, they too have received grace and enormous blessings (Colossians 2:10; Ephesians 1:3). The Gnostics promoted a spiritual hierarchy and caste system that required secret knowledge for advancement. They also taught that a person had to work through angels and many intermediaries to have access to God. The Bible rejects these views. The fullness of God is in Jesus Christ and the Christian is complete in Jesus Christ, who alone serves as a mediator and advocate for all who believe (1 Timothy 2:5). No superiority or inferiority exists among Christians. No one is lesser or greater than another. All Christians are equal (Galatians 3:26-28). NIV-John 5:19 Jesus gave them this answer: “Very truly I tell you, the Son can do nothing by himself; he can do only what he sees his Father doing, because whatever the Father does the Son also does. When Jesus blesses the loaves and the fish, he sees God in heaven making a creative miracle happen so that the the fraction and division of the food causes it to multiply. The cooperative nature of Christ’s earthly ministry with what God the Father is doing is easy to miss; especially when the gospel narratives don’t mention that aspect of each story. The central motif is the relation of a father and son as it would be viewed in this culture through the trade or skill the son was learning. We can think of Jesus growing up with Joseph in the carpentry shop, obediently learning skills and later imitating them… His activity is never independent or self-initiated but always dependent, deriving its purpose from the father’s will. In this model we have to remember there is no reciprocal relationship. The father initiates, sends, commands, commissions, grants; the Son responds, obeys, performs his father’s will, receives authority. Moreover, the Son does not simply draw inspiration from the Father, but imitates Him tirelessly. Jesus said to them, “I assure you that the Son can do nothing of his own accord, but only what he sees the Father doing. What the Son does is always modelled on what the Father does, for the Father loves the Son and shows him everything that he does himself, Yes, and he will show him even greater things than these to fill you with wonder. What is the application of this passage? Not every prayer request is answered, and certainly many are not answered right away, but it can stretch our faith to consider that Jesus did not initiate so much as he harmonized with God the Father already at work. Through the imagination we can see the Father working.